Stop and think about it: bonsai is the only full-fledged art form that uses a living medium. This presents both unique challenges and unique opportunities. To begin with, a bonsai artist's composition is never absolutely finished. Since it continues to grow, regular maintenance is required to maintain the design that was chosen for that tree. It is to be hoped that the artist’s skill will be growing at the same time. Then he or she will have the chance to apply those improved skills in ongoing refinement of the tree. 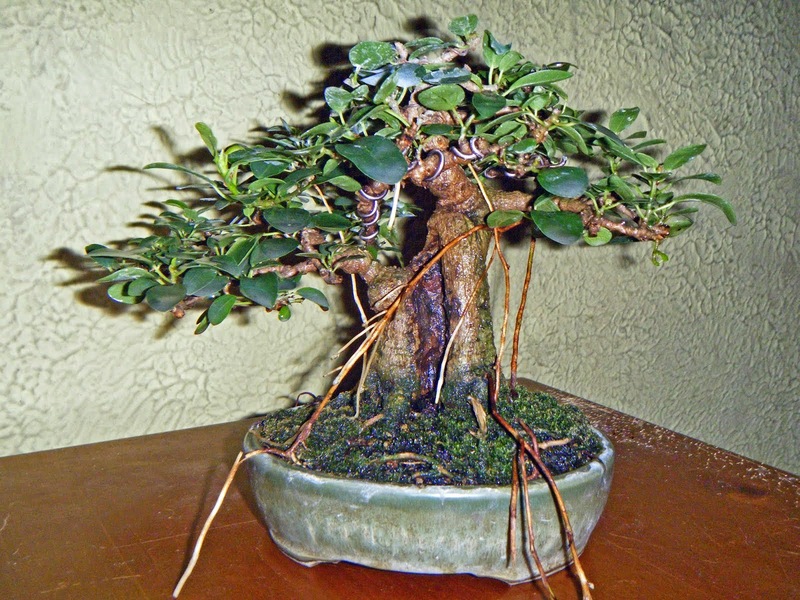 This can result in a bonsai that is even better than originally envisioned! Given enough time, any bonsai will outgrow its original design. (Although in some cases it may take several human lifetimes for that to happen.) Then the artist, or a successor, has the chance to exercise his or her creativity anew, choosing and executing a new design for what may have become almost an old friend. One benefit of such an opportunity is that one can avoid previous mistakes! Second, a plant's natural growth habit must be taken into account when a bonsai is designed. Many species have strong apical dominance and tend to shoot for the sky; others grow naturally as spreading or even prostrate shrubs; and some are happiest as multi-trunk specimens. Such considerations should be allowed to guide design choices. It is possible to ignore the tree's nature, but the price is a constant battle to suppress what the tree itself wants to do. At least one bonsai teacher wisely advised, "Let the tree tell you how it wants to grow." The need to respect a plant's native growth pattern may limit the design options somewhat. But many artists take it as an extra challenge to work within the restrictions imposed by the species’ genetic patterns and still come up with a creative, appropriate, and beautiful design for the plant involved. Another example of a botanic characteristic which influences the art side of bonsai involves the difference between deciduous and evergreen species. Since a deciduous tree sheds all its leaves every year, light can reach the inner areas of the tree in early spring and stimulate bud growth there. The same is not true for evergreens, and as a result they must be shaped in ways that allow light to reach every point where it is needed, right from the get-go. And third, because a bonsai is a living piece of nature brought close, it can and often does promote a greater sense of connection to nature as a whole. Through appreciation of a bonsai, one can develop a greater appreciation for the entire natural world and, if one believes in a Creator that stands behind it all, of that Creator as well. Hundreds of woody species are now being used for bonsai, with the result that the bonsai artist can usually find a species suited to what he or she wants to do. Do you like the character created by artificial deadwood? Yews have especially hard and durable wood, and are admirably suited to such treatment. Are you especially fond of root-over-rock bonsai, with their roots firmly clasping a rock and growing over it into the soil? Trident maple and Chinese elm are good candidates, with tough, flexible roots that adapt to such treatment nicely. Do you want a bonsai that can be enjoyed year-round? Take your pick among the tropical species that have become popular. One thing is certain: the bonsai grower need never be bored!